If you look closely at your lawn this time of year, you may think it is full of weeds. But in reality it could be a natural phenomenon that occurs in many turfgrasses in the spring called inflorescence – or flowering and seedhead production. Unfortunately, an abundance of seedheads can make a lawn look unattractive and the physiological effects on turf plants may temporarily reduce overall turf quality. And if you are sneezing a lot after walking on your lawn, you could be allergic to grass pollen, which comes from these and other grass seedheads in May. Seed production takes energy away from the plant and may cause turf blades to become sparse and off-colored. The seed stalks have fewer leaf blades and their woody structure resists mowing which adds to the eyesore. Sharpening mower blades can help. The seed production is seldom consistent throughout a home lawn and it sometimes occurs in patches. Thus, the problem is often made more obvious by patches of seedheads occurring in an otherwise smooth, dark green lawn. Turfgrass seed heads usually begin to form below the recommended mowing height of 3″ – 3 1/2″ for home lawns. The seed heads will still develop despite frequent mowing. However, you should NOT lower the mowing height in an attempt to remove all of them as they are a short-live aesthetic problem; they do not cause long-term damage to turf plants. The stress produced by low-mowing can cause long-term injury to turf plants. Frequent mowing will not prevent seed development, however, infrequent mowing will allow seed heads to fully develop and make the problem worse. 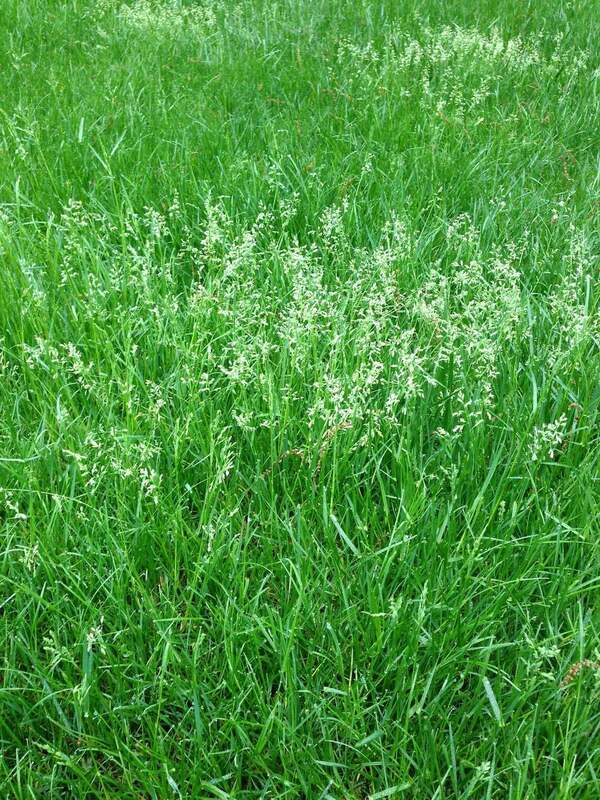 Note that the seeds that would develop on hybrid turfgrasses used in home lawn would not be viable seed. Thankfully, the unsightly seedheads and stalks will eventually disappear on their own by early June allowing Maryland lawns to return to an aesthetically appealing uniformly green carpet. 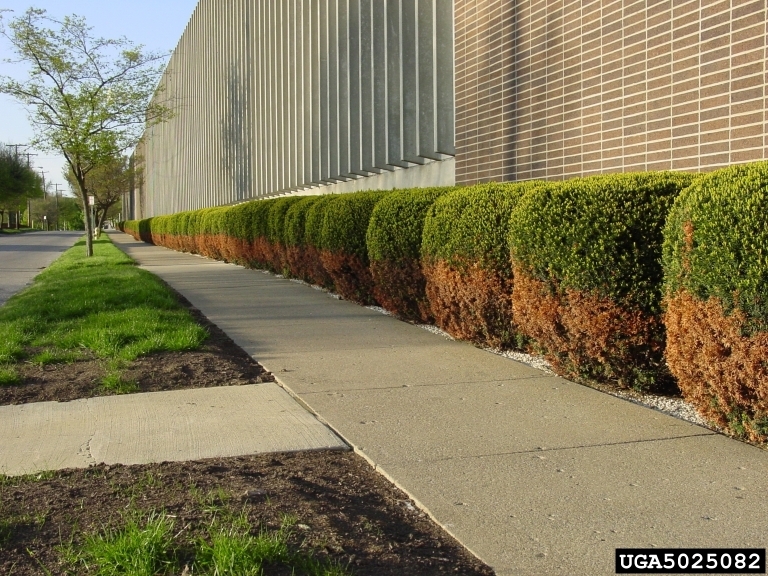 Injury due to salt is most common on landscape plants growing adjacent to highways, streets, sidewalks, and driveways that are regularly salted during the winter for ice control. Most of the salt used for deicing purposes is sodium chloride, ordinary rock salt or table salt. On highways, the major problem to plants is caused by salt spray kicked up by fast moving traffic on wet, salted roads. The salt spray is deposited on adjacent plants causing dehydration of evergreen leaves. In the city, the major problem is salt runoff washing into the soil. Salt in the soil may be absorbed by the roots and cause direct toxic effects. Salt spray causes bud death and twig dieback. Subsequent shoot growth at the branch base produces clusters of twigs known as “witches’ brooms.” Symptoms typically become evident in the spring. In evergreens and conifers, salt spray causes leaf browning or yellowing, needle tip flecking, and twig dieback. Salt in the soil is slower acting and may not affect plants for several years. Symptoms include an initial blue green cast to the foliage, marginal leaf burn or needle tip burn, reduction in leaf, flower and fruit size, premature fall coloration and defoliation, stunting, and a general lack of vigor. The symptoms often become evident in late summer or during periods of hot dry weather. Limestone benefits your lawn in many way. When your soil pH is too low or acidic, it needs limestone to bring it back into balance. Soil that is too acidic causes fertilizers and important nutrients to become ‘locked up’ and thus unavailable to the grass plant. Locked up nutrients may result in the grass becoming thin and yellow, allowing thatch to build up faster, and hinder root growth. Even with proper fertilization, a lawn with poor soil pH can’t fully utilize the nutrients applied to become thick and stay green. We suggest limestone applications for acidic lawns. Limestone may be applied any time of the year but is most effective when applied in the late fall or early winter because it is insoluble. Rain, snow, and alternate freezing/thawing of the soil at this time of year helps work the limestone into the soil. Movement of limestone into the soil is slow, even under the best of conditions. Even during winter months, there is something you can do to help your lawn. Why do soils become acid? Soils become acid through natural processes and human activities. The pH of most soils is controlled by the amount of rainfall. In humid areas, such as the northeastern United States, rainfall percolates through the soil, leaching ions such as calcium and magnesium which prevent the soil from becoming more acid and replacing them with acidic ions such as hydrogen and aluminum. Other natural processes that increase soil acidity include root growth and decay of organic matter by soil microorganisms. More information on soil pH and lime from Penn State here. The Baltimore Ravens have taken the field, nights have cooled and most of us are not thinking about our lawns. The end of summer doesn’t mean the end of lawn care though. Now is the time to think forward and prepare your lawn for next spring. Many homeowners think lawns need less care in the fall because the grass grows more slowly. In fact, just the opposite is true. During this time of year, grass is busily absorbing energy, moisture, and nutrients in preparation for a long, dormant winter. Here are some tips that will help your lawn get a head start for next spring. It may not be fun but it is necessary to rake leaves from your lawn as soon as possible. 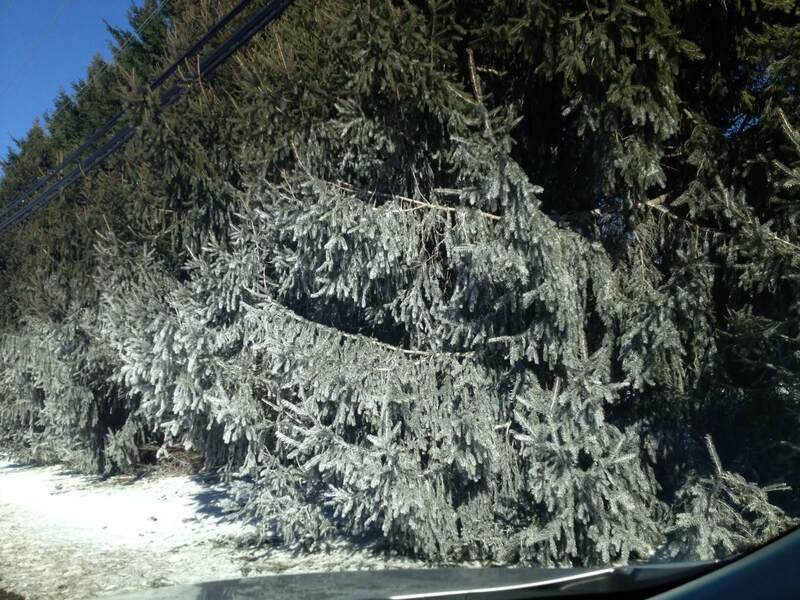 If you wait until all the trees in your yard are bare, it may be too late. The leaves will become wet from rain and morning dew, stick together, and form an impenetrable mat that if left unmoved will suffocate the grass and breed fungal diseases. It is important for the health of your lawn to limit the overall number of weeds it’s competing against. There are millions of weed seeds throughout your lawn lying dormant, waiting to be ‘activated’. They are brought by wind, rain, animals, even your mowing service. Mother Nature is resilient; she makes it hard to eliminate weeds completely. But with Pro-Lawn-Plus’s 5 treatment program and some good mowing practices you’ll, be on your way. Here are some University of Maryland guidelines for fertilizer applications. If you are not presently on a lawn fertilizer program, now is a great time to get started. A lawn professional has the expertise to apply fertilizer in a proper manner using the recommend rates. They are also aware of the environmental impacts of misapplied fertilizer. A professional has properly calibrated equipment, knows to blow granules off of sidewalks, driveways and patios and back onto the turf. 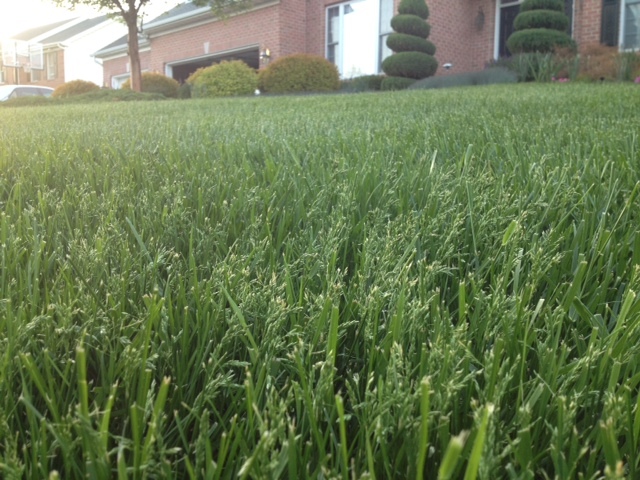 Properly applied lawn fertilizer does not runoff into the Chesapeake Bay. Properly fertilized lawns actually protect the Bay because a well-fertilized lawn provides dense vegetation which stops sediment loss which in turn carries nutrients from storm water into Bay tributaries and ultimately into the Bay. Now that summer weather has arrived, many of our customers start asking us about watering the lawn – what is the best time of day to water; how often; how long, etc. Our answers to those questions have changed over the years because of our concern about water conservation practices. Turfgrasses in Maryland need about an inch of water per week. If your lawn is fairly flat, try heavy, more infrequent watering. Usually an hour or so in each sprinkler location two or three times per week is sufficient. If your lawn is sloped, you will need to do more frequent, lighter watering to avoid the water running off of the slope. The best time of day to water is very early in the morning if possible. Mid-day and afternoon watering is very inefficient because the some water evaporates before it has a chance to get down into the root system. Evening or night watering is more efficient and is acceptable as long as your lawn is not susceptible to fungus diseases, which high humidity and free moisture promote. You will find if the weather is sunny and hot for an extended period of time, you are going to have a difficult time seeing the effectiveness of your watering because of high evapotranspiration rates. It makes sense to wait until any heat wave breaks and we have a few cloudy days to help make your watering more effective. 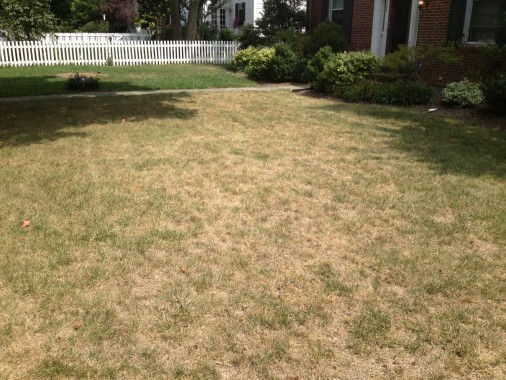 Heat stress and drought can affect your lawn quickly. If you are having difficulty with your lawn growing or are frustrated with a thin and thatchy lawn, you should strongly consider late-season lawn seeding. Late summer is the ideal time to decide if your lawn needs new grass turf or lawn seeding work for the upcoming year. Careful advanced planning and follow-up of lawn seeding can make the difference in your lawn growing and determine the success or failure of your lawn seeds. We have a limited time window to do proper seeding. Current customers, contact Pro-Lawn Plus NOW to ensure we can schedule you this year. If you’re not yet a customer, now is a great time to start service and prepare your lawn for next year.